"It’s funny the way the stuff you like as a kid can have such a lasting impact, when at the time, you’re just goofing around watching wrestling and absent-mindedly learning some pop punk licks." 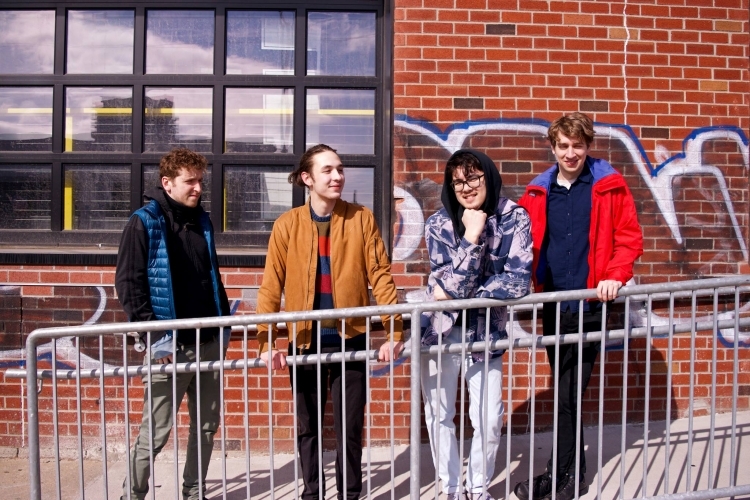 Brooklyn four piece jangle rock outfit Twiga are a self-described “band of friends,” and from the top of their 2016 EP Million $$$ Dream that type of close-homie energy is immediately apparent; in four short, sunbathed tracks, the EP reads as the musical equivalent of a buddy-comedy-road-trip-to-the-beach film, made possible by the band’s classic guitar licks and front man Dave Lucas’ easygoing, occasionally melancholic lyricism. Top it off with the fact the record is dedicated to “The Million Dollar Man” (and former pro-wrestler) Ted DiBiase, Million $$$ Dream reads as an inside joke we can all get. Thankfully, Twiga promises to bring that same friendly vibe to the East Village’s Berlin on October 3rd. Your bio mentions a love of blink 182 and I can hear a little bit of them in some of the hooks on Million $ $ $ Dream - but also a lot more than that. What are some albums from your childhood that changed the way you think about music? Dave: I took guitar and piano lessons as a kid and had some really awesome teachers. But what I truly remember getting me hooked on guitar was spending hours at night sitting on the floor with my tab books for Sublime (S/T) and blink 182’s Enema of the State. It’s funny the way the stuff you like as a kid can have such a lasting impact, when at the time, you’re just goofing around watching wrestling and absent-mindedly learning some pop punk licks. As a group that’s been around for around 8 years, what has been the biggest challenge that you have faced and what has been the glue holding you together? I think setting achievable goals and then working towards them really helps. Being a band takes a lot of hard work, a lot of resources, money, and patience, all so we can schlep our gear around the city to make music for people. The moments when we can feel proud of what we’re doing really help to inspire us to keep writing and challenging ourselves. On top of that, staying prepared and communicating well removes friction that can waste a lot of energy. “Phi” starts off with a catchy jangle pop tune before becoming a chaotic and abrasive jam. How do you balance the harsher and more complex elements of your music with the more accessible moments? When I first started writing songs for this band, I made it a mission to try to make my songs dynamic. Some of our favorite bands like Pixies and Yo La Tengo play with dynamics so well, and to me that’s how you make a big, loud moment count – by surrounding it with softer, quieter moments. That can be kind of scary, because it usually means that at some point in the song you’re turning down all the distractions and the bells and whistles, but in the end the payoff is usually worth it. On your Bandcamp page, you have genre tags that reference the WWE and the WWF and a bio referencing a love of giraffes. Whats the significance of these nonmusical elements of your music? Finding non-musical inspirations for my music and songwriting is one of the most fun parts about this whole project. If you only want to be inspired by bands you like and other music, you’ll likely just end up sounding exactly like your influences (if you’re good enough). I think what makes bands unique is going out and trying to translate something beautiful into music. It keeps you original, and frankly keeps me from getting music fatigue. You’ve mentioned covering Green Day’s Dookie at live shows and have referenced a love of Belle & Sebastian covers before. How does covering more established artists inspire you? I’m pretty sure we all start out playing covers. My first band in Junior High (shoutout to Mutt) played 20 blink 182 songs, 2 green day songs, and 1 sublime song. And we loved it so much. We’re all doing this because the music we’ve heard in our lives has inspired us to work very hard, and I think that if you’ve established your group’s perspective and aesthetic well enough, bringing covers in can be a really fun reward, and a way to get the band to experience what a great song feels like. You can learn a lot from getting into the guts of a great song. Your Facebook posts often encourage awareness about social issues like aid for immigrants and refugees - what role does raising awareness for issues play in your music? I think what we’re learning right now is that society is fragile, and that if you’re not informed, you can easily witness rights and freedoms that past generations have fought for just slip away under the right conditions. Ultimately, social issues are part of a large group of things that influence my music, but I think sharing your voice as an artist means sharing important information when you can. One organization that really encouraged us to get involved was Headcount.org, who reached out to partner with us a few years ago. And I hope that we and the generations who come next remember this time period and vote, vote, vote for the rest of our lives. What other like-minded local acts do you guys like to play with these days? True Dreams, Color Tongue, QWAM, Fat Heaven, Kissed by an Animal, Zuli. All good people making interesting and entertaining things happen.